A recent article from a well-known reverse mortgage proponent suggested that rules regarding cross-selling the loans and other financial products may have gone too far — a suggestion that was met with both caution and some qualified support from the larger Home Equity Conversion Mortgage community. “A borrower who uses a HECM to finance the purchase of an annuity may be a better credit risk than a borrower drawing a tenure payment,” Jack Guttentag — who runs the Mortgage Professor blog and loan comparison site — wrote in a July post on ways the program could attract borrowers that represent less of a risk to the Department of Housing and Urban Development’s insurance fund. In Guttentag’s assessment, a homeowner who used HECM proceeds to buy a retirement product such as an annuity would have less of an incentive to hide a move to a nursing home, for instance; with the cash from the annuity, he or she would feel comfortable alerting his or her servicer to the move-out. “Concealing a move-out can result in a longer period in which a house sits unoccupied, or occupied by non-owners with no interest in maintaining it,” he wrote. Guttentag, who frequently writes about responsible uses of reverse mortgages, acknowledged the reasons behind the cross-selling ban. Part of the HECM’s reputation issues stemmed from stories of unscrupulous lenders and brokers who urged seniors to pour HECM proceeds into high-cost investments in order to increase their own commissions — often at the expense of the borrowers’ best interest. Over the years, a strong firewall between HECM lenders and investment brokers has been erected, which has served to reduce fraud and largely protect seniors. But as more academic sources call on both seniors and financial planners to consider home equity as part of retirees’ overall financial plans, some well-meaning advisors have run into issues. Brokers can face fines from their parent companies for even discussing reverse mortgages as potential options for their clients, and some HECM originators require borrowers to sign legal documents affirming that the originator receives no compensation from third-party brokers as a form of regulatory protection. When asked about the issue, many reverse mortgage advocates and professionals noted that while using a HECM to purchase annuities or other investment products could have some benefit in specific situations, the risks could easily outweigh the rewards — for both borrowers and the industry at large. Davison would only be comfortable in situations in which a true fiduciary — someone acting in a homeowner’s best interest, with no financial incentive to recommend any one particular option — determined that such a transaction was appropriate. Because both reverse mortgages and annuities are each unique tools with specific uses, he said, the potential for misunderstanding the long-term pros and cons is simply too high. Beth Paterson, executive vice president at Reverse Mortgages SIDAC in St. Paul, Minn., echoed the idea that annuities could have a place in a borrower’s long-term plans — for instance, if he or she eventually needs funds for an assisted living facility or other institutional setting — but emphasized the need for full transparency and clarity. “Annuities are not bad products if they are done with full disclosure and in ethical ways,” Paterson told RMD. Annuities have often seen support and analysis from academic sources. For instance, when calculating its annual National Retirement Risk Index, the Center for Retirement Research at Boston College assumes that seniors will annuitize their assets — including proceeds from a reverse mortgage. Jamie Hopkins, director of the Retirement Income Program at the American College of Financial Planning in Bryn Mawr, Pa., classified the current rules as potentially too restrictive in that they occasionally discourage well-meaning planners from discussing all available options; he also cited research from the Massachusetts Institute of Technology indicating that annuities might provide an overall better outcome for seniors than the HECM tenure option. “I think in this specific area, the rules and company policies might have swung too far towards consumer protection and are actually causing some harm by restricting better planning and product delivery,” Hopkins said, though he did add that risks around improper “churning” and excess fees remain legitimate concerns for seniors. And that gets to the core issue at play: how to balance the potential for fraud and abuse with the upsides of being able to present seniors with a wide array of options. “The risk of bad behavior on the part of originators and financial product salespeople is far too great to relax the rules,” Holland said, adding that opening up a passageway between the two might in turn lead to even greater regulatory and compliance headaches for players on both sides. 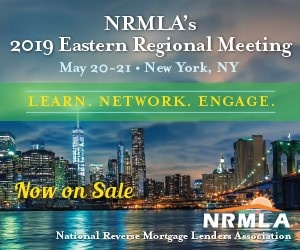 “I doubt such increased regulatory costs, and the corresponding increased compliance costs to financial/mortgage firms, would be worth the potential benefits of relaxing the existing cross-selling limitations,” he said. But that reputational risk can go both ways, according to broker Tim Linger of HECM Senior Home Financing in Orlando, Fla. While he observed that there have only been a few cases in which a HECM/annuity combination would work well for a borrower in his experience, Linger thinks the strict rules may have had the unintended consequence of stigmatizing the reverse mortgage further.